Convince the Louisiana TANF Director to create a brand for the TANF office and implement a statewide campaign in order to communicate what programs and services were available, who was eligible, where the services were provided and how they could be accessed. 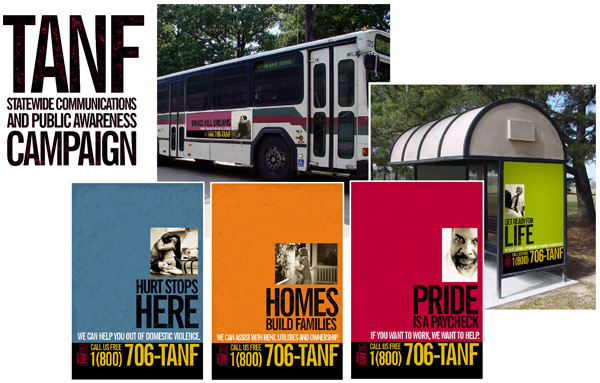 The TANFProgram was created by the Welfare Reform Law of 1996 and became effective July 1, 1997, replacing what was commonly referred to as welfare. It provided assistance and work opportunities to needy families by granting states the federal funds and wide flexibility to develop and implement their own welfare programs. Louisiana needed to demonstrate capacity and viability or risk future funding. Develop and execute a comprehensive strategy for a statewide marketing campaign including the recommendation for the creation of a toll-free number and full-time call center. Draft formal request for proposals for all contracts (advertising/PR, call center) and organize evaluation and selection process. Supervise and consult on all creative development (concept/copywriting/design) as well as overall media strategy. Recommend and develop collateral communications tools (information survey, intranet, FAQs). Train representatives from multiple state agencies on how to support and leverage the campaign. Develop architecture for call center sequence (write script for caller inquiry categories and operator responses). Strategically support the TANF office on all matters related to program development, implementation and promotion.